The Bible is mysterious, surprising--and often deeply misunderstood. Dr. Michael S. Heiser, an expert in the ancient near east and author of the best selling The Unseen Realm, explores the most unusual, interesting, and least understood parts of the Bible and offers insights that will inspire, inform, and surprise you on every page. Dr. Heiser has helped to remind the church of the supernatural worldview of the Bible. 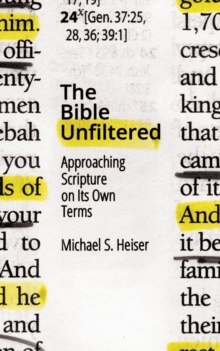 In The Bible Unfiltered, you will see his methods and expertise applied to dozens of specific passages and topics. Gleaned from his years working as Faithlife's scholar-in-residence, this is some of the very best of Dr. Heiser's work.